As is quite obvious from reading this blog, I attend a lot of theater. Most of it is by myself, but once a year I get a group of friends together for something we like to call "Girls' Night Out at the Theater." For some of my friends, this is their once a year trip to the theater, so I take my responsibility seriously and try to choose a good show, preferably by a local theater. This is the second year in a row I've chosen a Theater Latte Da production. Last year we saw The Full Monty, which was was a huge success. Everyone loved it (which might have had something to do with the naked men ;), and it was one of my favorites of last year. So I was confident in choosing Latte Da's Evita this year, knowing they'd do a great job again, and I wasn't wrong! As everyone probably knows, Evita is an Andrew Lloyd Webber musical about Eva Peron, the Princess Diana of Argentina. It chronicles her rise from a poor family in a small town, to actress in Buenes Aires, to wife of the president and "spiritual leader of the nation." I've never seen the stage show but I have seen the movie and have the soundtrack, so I was very familiar with the music (unlike the previous night's show, Rock of Ages). But what I had forgotten is that there's very little spoken dialogue; it's pretty much two and a half hours of singing. This was a pretty large production for Latte Da; they usually do more intimate shows with smaller casts. It was beautifully directed by Artistic Director Peter Rothstein. There was a lot going on - costume changes, set changes, people constantly moving in and out. All done to music, and all accomplished very smoothly. The four-person band led by Musical Director Denise Prosek was off-stage, but sounded beautiful. The choreography was amazing and made me want to take tango lessons! Like all Latte Da shows I've seen, this show was perfectly cast. I don't know how they do it, but they seem to always find the perfect actor in the Twin Cities (or elsewhere) to play each role. The strong ensemble includes Erin Capello and Kahlil Queen, whom I saw in Latte Da's concert at Lake Harriet this summer. The title role is played by Zoe Pappas who has worked frequently with Latte Da, the Chanhassen, the Ordway, and other local theaters. She has an amazing voice (which is good because she pretty much sings for two and a half hours straight), and also beautifully embodies Eva's passion, drive, and ultimate physical collapse. Kevin Leines is a suave, elegant Juan Peron (and the only man in the cast who's taller than Zoe!). The character of Che, who functions as a narrator, is played by Jared Oxborough. I first saw Jared in Footloose at the Chanhassen earlier this year (in which he co-starred with Zoe), and was immediately struck by his voice and presence, and wanted to see more of him. I also saw him perform a song from Urinetown (a smart, funny musical that's at the top of my wish list for Theater Latte Da) at a cabaret performance called Where's My Tony? Che is a perfect role for him; he really carries the show and drives the narrative. Eva and Che are the main characters and are both onstage for most of the night, but they rarely interact. Che is mostly observing and commenting to the audience, rather than taking part in the action. But they do have one waltz together, which really illustrates their opposing viewpoints in the way they dance and sing together. 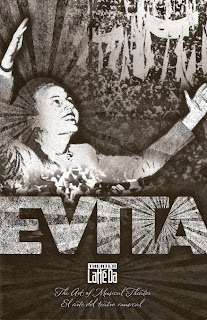 Was Evita a selfless hero to her people? Or a ruthless politician? My guess is a little of both. Evita is the first production in Latte Da's four-show season. Their annual Christmas concert with vocal ensemble Cantus, All is Calm, will be followed by a new play with music, Song of Extinction, at the Guthrie Studio early next year. Their final show is Steerage Song at the Fitzgerald Theater next summer, a collaboration with my favorite pianist Dan Choinard (OK I don't know many pianists, but he's very talented and entertaining!). If you're looking for a fun night at the theater with great music and great performances, you really can't go wrong with any of these shows.